OCEANFRONT Spectacular ocean view from both levels. 2 bedrooms, 1 bathroom, living/dining room, kitchen, two balconies. MW, DW, 3 Satellite TVs, DVD, WiFi. ONSITE POOL. NO PETS, NO SMOKING. ONE (1) SET OF BED LINENS & TOWELS PROVIDED. BEDS: 1 Queen, 2 Single (extra long). Accommodates 4. WiFi/DSL, ONSITE POOL, NO PETS, NO SMOKING. BEDS: 1 Queen, 2 Single (extra long). Accommodates 4. All aspects of our stay were well organized and easy. Renters should know that the beautiful boardwalk inside the seawall has been destroyed with no word on when or if it will be rebuilt, and there is no direct beach access from here. Bike rentals from the Villas is more expensive than other places. We had a great laid back vacation at Lighthouse View. The Bistro is very good and service was excellent. We loved the views and layout of the condo. The entrance is located on the second floor and the bedrooms are up another flight of stairs. One bedroom and the living room have views of the ocean. The closet of the bedroom with twin beds fits a pack n play perfectly (in the event your baby needs a dark place to sleep). **There is NO direct access to the ocean from any of the villas since the placement of boulders to prevent shore erosion. There are no walkways or steps over these boulders. You will need to drive south past the Holiday Inn on walk to Driftwood beach to access the water. Location perfect, near ice machine, pool, laundry. Disappointed walkover was not available for beach access. Everything was great, views of sunrise from bed! We loved the Condo. Nice view of the beach and ocean. The Condo was clean when we arrived. We did didn’t have any problems with the Condo. We love staying in waterfront properties on our vacations and this condo did not disappoint! It is in a perfect location, very close to Driftwood Beach and listening to the ocean waves was relaxing. We had everything we needed and Jekyll Realty was very easy to work with. Thanks! Weather was uncooperative but we had a great vacation nonetheless. Lighthouse View has an amazing view of the ocean, is cozy and perfect for a family of four. My family and I came down for a work related conference. This condo was our home base. Everyone really enjoyed their visit, especially the easy access to the beach. We celebrated our 28th wedding anniversary on Jekyll Island, staying in Villa 352, and it was a great choice! It was perfect for us, everything we expected and more. We especially appreciated the fantastic ocean view! The house was clean and pleasantly furnished with a welcoming atmosphere. Jekyll is the perfect place for us! - quiet, scenic, down-to-earth, with all kinds of unique opportunities. We enjoyed the sea turtle hospital, shore fishing, bike riding, and best of all, the boat tour by Captain Philips and Jekyll Boat Tours! They were the best! We saw not one dolphin but many! Plus got a hands-on (literally!) education on many different species of fish due to the net drag he did for us! They did a phenomenal job and we recommend them highly! We enjoyed the unique beach scenery on both driftwood beach and sand dune beach. We didn't have as easy access to the beach as we had expected, which was the only disappointment. The walkways we saw pictured were broken/blocked, and we weren't able to use them. However, we assumed that was due to the recent hurricane, and hopefully they will soon be repaired. Otherwise, it was above and beyond our expectations! 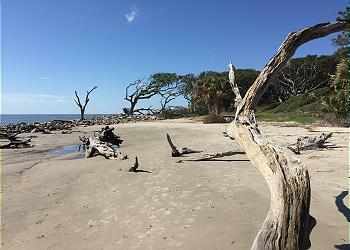 Jekyll island Realty was wonderful and check in and check out went as planned. They gave us useful information about the island that was helpful to our trip. The on site management and maintenance at condo were very helpful and friendly. The condo itself had a perfectly stocked kitchen for cooking and beautiful sunsets from the balcony's. Bed in Master was very comfortable but frame may need replaced and it was squeaky. Twin beds were perfect. The only downside was it could be cleaned better. Under couches,bed and bath floor were filthy. Living room furniture do able but old. Great for biking. Pool was awesome. downside was the tides rule your life and not much time in between tides for beaching. The price was right and would stay again for price. This is one of the best vacations we have had in a long time. We appreciated that it wasn't crowded or noisy. Overall, we were very pleased with our stay at Villa 352. Our main disappointment was with the beach access being unusable. Without the beach access, I feel we didn't get a great value for the price paid. We could've stayed at other places for less money, but we chose Villa 352 because of its beach access. All that said, we still really enjoyed our stay. The unit is comfortable and (mostly) clean. I say mostly because we did experience an ant problem in the kitchen. Our box of cereal, not sealed but closed properly, attracted ants. We did leave the box on the counter instead of putting it away in a cabinet, but that's because the cabinets are already full of dishes, etc. A pantry of some sort would be very nice. We loved the view from the top balcony, the double sinks in the bathroom, and the TVs with satellite in each room. My family and I have been renting Lighthouse View for years. It is a very beautiful property with exquisite views of the ocean. It is our happy place! The only thing that could make it better would be to have a broom to help keep it clean and for a bit more of a thorough dusting job (the ceiling fan in our room was caked with dust, and behind the beds) prior to our stay. We especially enjoy dealing with Jekyll Realty! Beautiful view from deck. Clean nicely decorated condo. Loved the villa great view, pool bungalow ,food. here we are again !! enjoyed are stay here - again. Love the view and the unit is great. My girls played in a golf tourney at Indian Mounds on Jekyll Island in late March. We stayed at the condo for 9 nights. It was great for us! The girls had their own bedroom and TV, and we had the great view and the sound of the ocean every night. It was very clean, and had everything we needed. We used the laundry facilities, and they were very close, clean, and safe. I'd highly recommend this condo! It was even less expensive than the Holiday Inn Resort on the island! The location of this unit is great. Laundry, ice machine and boardwalk to beach only steps away. Made it nice for that first coffee with the sunrise. Great location and beautiful trip. Close to pool, boardwalk, restaurant, laundry (if you have to! ), and a short walk to Driftwood beach. Didn't hear any neighbors, beautiful views from room. Nice decor. Comfortable beds. Staff helpful and responsive. Could have been a bit cleaner. My daughter is crawling and we quickly learned we needed to clean the floors better as soon as we got there.